MODEL HOME/OFFICE: BEAUTIFUL NEW BRICK CONSTRUCTION CUSTOM BUILT 3 BEDROOM, 2 BATH HOME SITUATED ON A QUIET STREET IN A WONDERFUL TRUE NEIGHBORHOOD. THIS HOME BOASTS HARD TO FIND FEATURES. ENTER THIS IMPRESSIVE HOME BY THE FRONT DOOR AND YOU ARE GREETED WITH GORGEOUS WIDE-PLANK HARD WOOD FLOORS IN THIS LARGE OPEN FLOOR-PLAN. THESE GORGEOUS HAND SCRAPED BIRCH FLOORS ARE THROUGHOUT THE ENTIRE LEAVING AREAS. THE APPOINTMENTS INCLUDE CHAIR RAILING AND SPACIOUS VAULTED CEILING. A FORMAL DINING AREA, SMART KITCHEN WITH PANTRY, UPGRADED SOLID WOOD KITCHEN CABINETS WITH SOFT SELF CLOSING RAISED PANEL DOORS AND SELF CLOSING DRAWERS, PORCELAIN TILE COUNTERTOPS, STAINLESS STEEL APPLIANCES AND CUSTOM GLASS AND STONE BACK SPLASHES. LED KITCHEN AND UNDER-CABINET LIGHTING. THIS STUNNING KITCHEN IS OPEN TO THE BREAKFAST NOOK WITH LOTS OF NATURAL LIGHT. THE 20 TILE IS COMMERCIALLY RATED WITH COLOR THROUGHOUT. 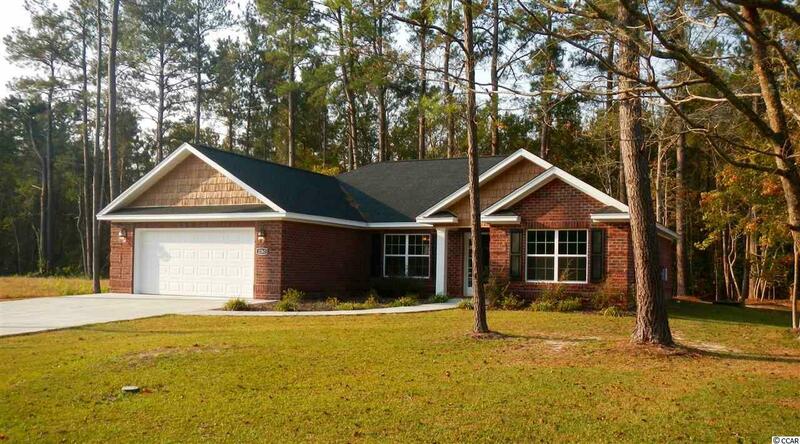 THE MASTER BEDROOM HAS TRAY CEILINGS AND LARGE WALK IN CLOSET WITH SHOWER AND SEPARATE GARDEN TUB IN THE MASTER BATH. COVERED FRONT ENTRY PORCH. OVERSIZE GARAGE INCLUDES UTILITY SINK WITH DOOR TO THE SIDE YARD AS WELL AS ENTRY TO KITCHEN THROUGH THE LAUNDRY AREA. ATTRACTIVELY LANDSCAPED EASY YO MAINTAIN YARD. ALSO INCLUDED IS A 10 X 12 PATIO AT THE BACK. THIS TRULY FANTASTIC HOME HAS THE FEATURES YOU WANT; LOCATED JUST OUTSIDE OF LORIS ONLY 15 MINUTES FROM CONWAY AND 30 MINUTES FROM THE BEACH. DON'T LET THIS GEM PASS YOU BY. Square footage is approximate and not guaranteed. Buyer is responsible for verification.